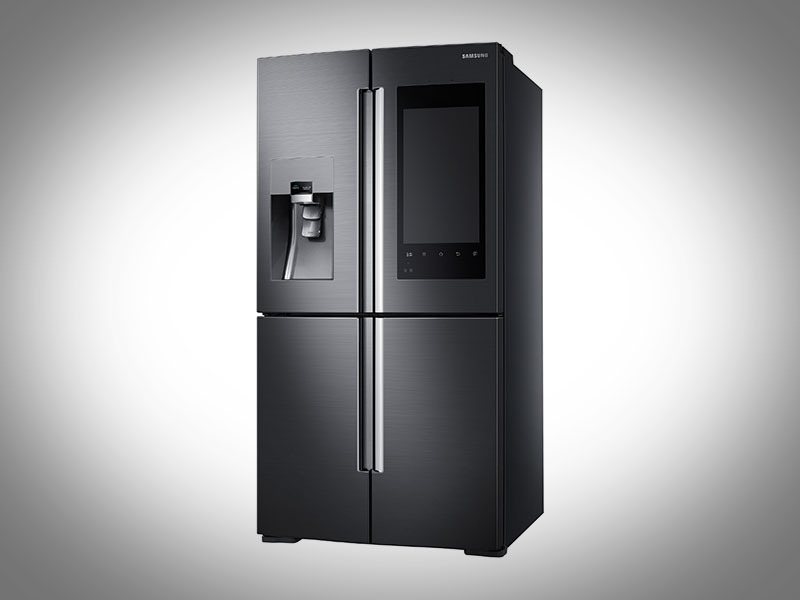 In the name of innovation that is so inherently CES and the impending Internet of Things (IoT) revolution, Samsung has announced a new fridge to its ‘Family Hub’ lineup of home appliances that comes with a 21.5-inch full-HD touchscreen built right into the four-door refrigerator. As you can expect, you will need to keep the Family Hub refrigerator connected to the Internet at all times to truly deliver on its potential. Easily the highlight of the device – except the giant screen on the outside – is a fixed-camera that will help you keep an eye on your food and watch closely as the lettuce goes bad. You can also set a due date for items so you can be reminded later on and replenish stocks by doing your shopping right off your new IoT-refrigerator. The latter will work if there are distributor partners in place, and the fridge will alert you of any sales they are currently running. Samsung has also collaborated with chefs to offer various recipes and seasonal food options, although it remains unclear if the Internet-enabled information will work in tandem with what’s actually inside the fridge. With an entire operating system in place, you can even log into your fridge on the go via your smartphone, which should be useful in determining whether you need more nacho dip, apart from glancing at the temperature and humidity levels of the system. The smart fridge ought to render sticking Post-It notes a thing of the past, as you can now leave messages for your family on the huge display. It will also allow you to control other devices that are a part of your Internet-enabled home infrastructure, including the South Korean company’s own SmartThings ecosystem. Samsung has also fitted the refrigerator doors with two stereo speakers that will broadcast news and weather from partner websites in addition to play music off the radio. There is no word yet on pricing or availability from Samsung, but expect a launch in its home country of South Korea first. If you want to get a hands-on, Samsung will be showcasing the ‘Family Hub’ fridge at CES 2016 in Las Vegas from Wednesday to Saturday.